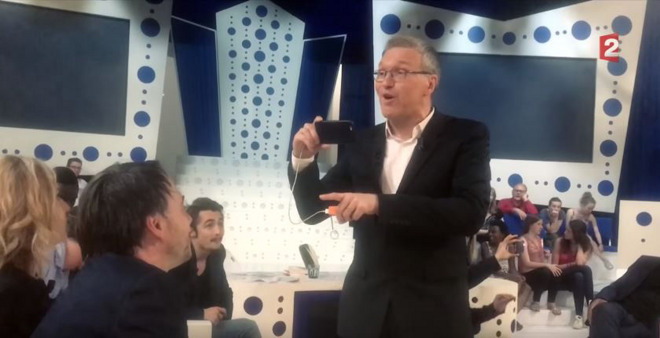 Following a sudden power outage in the studio, part of the Saturday episode of a popular French talk show was reportedly shot on Apple's iPhone. Power to France 2's equipment shut off around an hour and 45 minutes into the taping of On n'est pas couché ("We're Still Awake"), according to iPhon.fr. After three hours the crew eventually decided to make use of limited lighting and several Plus-model iPhones to continue shooting, the results of which were edited and broadcast, as well as uploaded to YouTube. The incident may represent one of the first times a major TV show has been shot on iPhones without it being an intentional gimmick. Apple often touts the quality of video recording on iPhones, particulary on the iPhone 6s Plus, which can shoot in 4K resolution with optical image stabilization. It's not clear though whether France 2 made use of that phone or the older 6 Plus, which records in 1080p and limits optical stabilization to photos. Camera technology is expected to be a major emphasis of the new iPhones shipping this fall. The "7 Plus" should in fact come with a dual-lens camera, although Apple's standard 4.7-inch model should have camera upgrades as well.